I don’t openly profess my love for washi tape nearly enough. But trust me, it is a thing of magical proportions. If you haven’t used it before, washi tape is basically fancy decorative tape. Which means that anything you can stick it to can be made infinitely prettier. Case in point – a set of plain magazine holders. I’ve never considered myself to be a magazine person, but after looking over my coffee table and book shelves, I realized that I own a heaping collection of magazines. 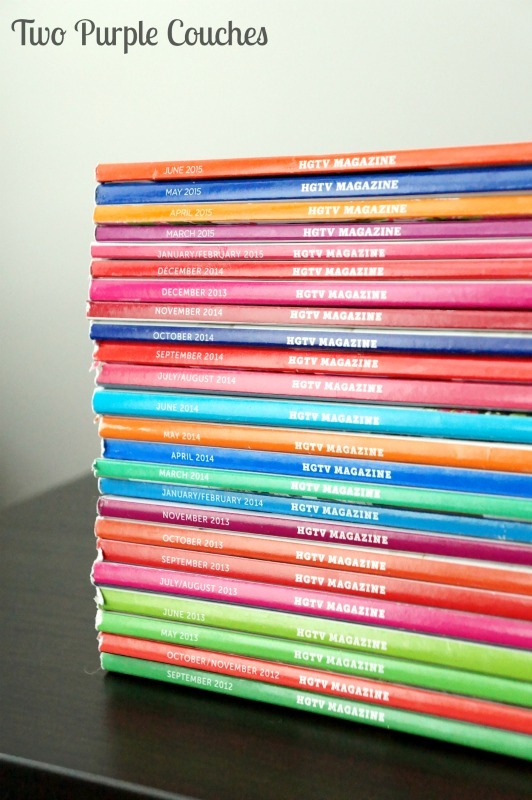 And most notably, pretty much every issue of HGTV Magazine that’s been published since it debuted in 2012. And it was time to get all of these issues in order. While it’s true that these magazine holders were doing a perfectly good job of holding magazines before I added the washi tape accent, they looked a little boring doing it. So why not jazz things up a bit? 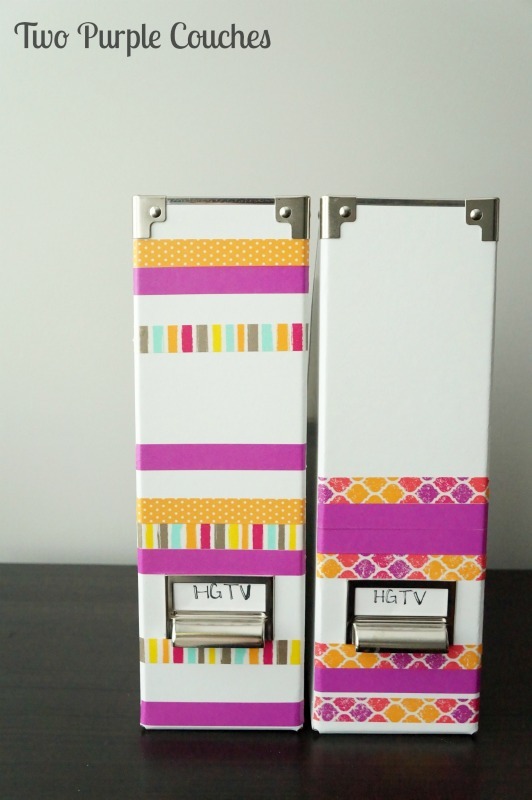 Grab as many rolls of washi tape as you wish. 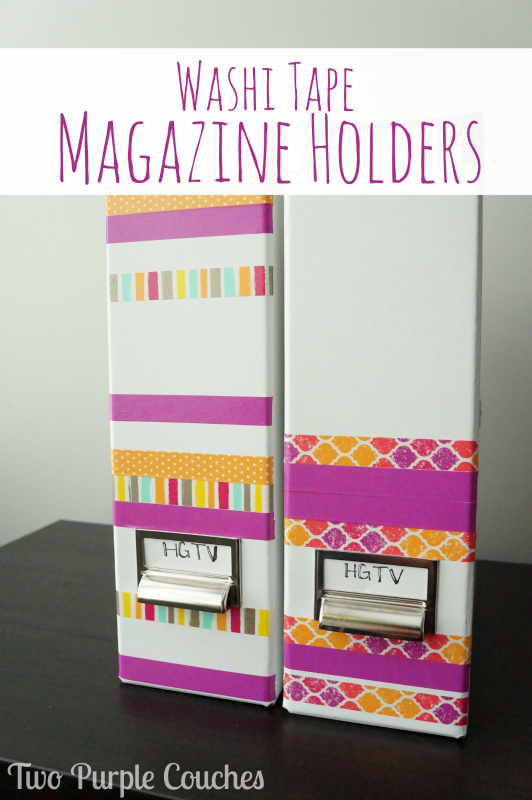 Cut some strips of tape and—BOOM!—instantly prettier magazine holders! Here’s a tip I picked up while working on these: for crisp edges, position your tape and leave a little hanging over each edge. Then use a craft knife to cut off the excess. Much better. Much, much better. A little pop of color and pattern makes everything better, dontcha think!? This entry was posted in Made It Myself on June 11, 2015 by Two Purple Couches. 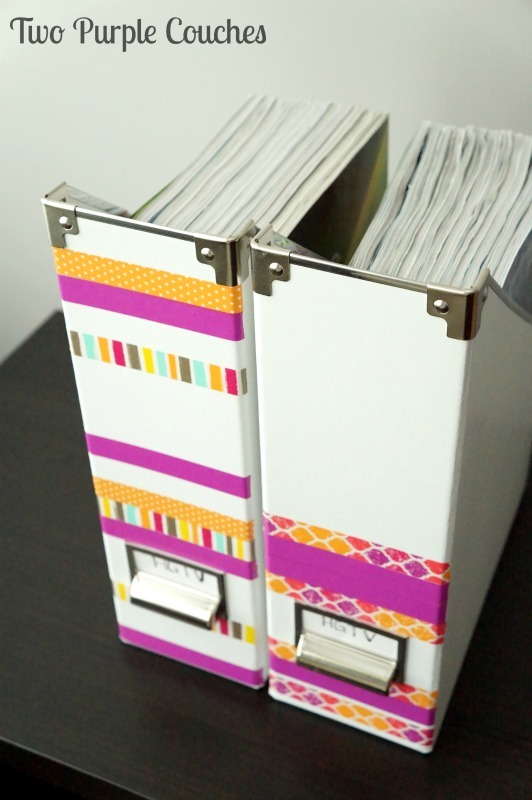 I love washi tape but have a hard time thinking of projects to use it in…..this is a GREAT idea though! And I love the color combo you chose too! Christine | Where The Smiles Have Been recently posted…20 Patriotic Craft and Decoration Ideas! I think washi tape is magic too Emily! I love the pop of color that they give your magazine holders. Thanks Kelly! It’s one of my can’t-live-without crafting supplies! Super cute idea! I love all of the color this adds and I could definitely use some cute storage! Those are too cute! I’m just a tad addicted to washi tape also. Or I should say I keep buying it, but rarely actually get around to using it. It’s just so pretty to look at!